I also found that just riding a bicycle (which I hadn't in years) was very helpful with balance and practicing pressing to turn. I still have the Ninja, got licensed this July, and am ready for my next (bigger) bike. Hoping to find a Yamaha FZ6 next spring. Already have almost 2,000 miles and fall has only just begun! Comments for Gain "Passenger Experience" First! I wasn't so lucky. I first decided to get a motorcycle because it was much more cost effective than even a used car. Not only that, but I felt pride in that I would be independent, in that I didn't know anyone else who rode. I would be able to learn how to fix minor problems my bike on my own, instead of always paying for the shop to break something else before charging me to fix both! Unfortunately, not knowing anyone else didn't do me any favors because I'd only ridden about 4 times between the ages of 6 and 9. Now I'm 19 and have my license but buying the bike is terrifying because it's not like a new pair of uncomfortable boots that I can take back in a few days...It's a one time shot. I have spent 5 months shopping around and it seems like bikes just keep getting more expensive, the more I learn about them! I wish I'd had a mentor to show me the ropes and teach me how to ride. When I took my safety course, I was the only person of eight (one of two females and the other had been riding for 29 years) who did not already own and regularly ride my bike! I didn't even know that I needed to shift gears! I thought that the instructor would at least go over the controls, but instead she just yelled at me when I stalled the bike. Big learning curve, but I it accelerated my eagerness to go online. I'm so glad I found this site! Thanks for all the great advice!!! For years my father had an old Honda bike sitting in the back yard. I used to get on it and feel it out, but it never ran. 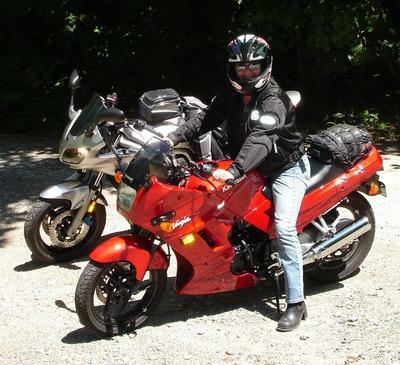 About 5 years ago my father purchased a Kawasaki Vulcan and started riding again. I rode with him a few times and really loved it. I learned to lean with the bike, hold on to him, adjust my balance during breaking... etc. He paid for my Motorcycle Safety class and then took me to get my first bike. We had our first family ride with him, myself, and my brother in law. It was very good fun. Now I'm trying to get my partner to ride on the back of my bike once I get a few more miles under my tires. Maybe then we can all ride together. I also gained passenger experience, and this fueled my passion to ride. If you happen to be so lucky, it's a great way to see if you even like riding. Ride along with someone who you feel comfortable with, and see if you like the back of a bike, because that may indicate whether or not you want to own a bike at all. My father's generous advice and patience (especially as a KID on the BACK!) helped immensely in my first time on the bike alone. If this isn't available, talk to someone at a local dealer and see if they'll take you for a ride ( I bet they will!). If I waited until I was able to get passenger experience before learning to ride, I would propbably never have learned to ride. You see. I didn't KNOW anyone who rides until after I took the MSF course, and after I bought a motorcycle myself. I know of some folks who didn't learn because thier pillion experiece was so terrifying. If you know a smart rider who is willing to take you around, then then is probably is a helpful to get some experience on the back to see if you like it. Thanks, Rebecca - I think your advice is great, especially since I did just the opposite!